Lets do some basic math work first. Reading this next part you’re probably thinking “We already know all this” but in case you don't know how to figure out probability this should help. We have 60 cards in our deck. We will draw a hand of 7 and then set aside 6 prizes leaving 47 cards in our deck. So lets determine the likely hood of our first draw. If we have 4 copies of a card in our 47 card deck the odds are 57% to draw it, 3 copies 42%, and 2 copies 28%. We can continue this ratio as we continue play. Count your deck, count the copies left and divide. This is not steadfast however and odds are a slippery slope. Sometimes you bet big on poor odds it pays off. A key skill in jumping from a casual player to a competitive player is knowing your own deck. When you can list you’re entire list by heart you’re doing something right. This will also allow you to make better judgment calls. The first time you dig into your deck you should be able to know what your prizes are. As soon as you know what six card you've set aside you can guarentee your probability math is correct. I often find myself relying heavily on certain cards so I try to make mental notes of how many copies of those cards I have. 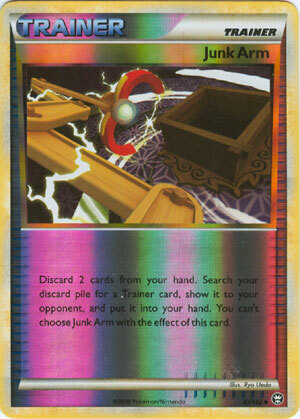 Junk Arm is the card I do this with the most. I like to keep track of Catchers and Switches as well. Odds and probability are great for your end but what about your opponent? This is where things can get tricky. You’ll have to make some assumptions about their deck list but we can follow some general rules. For example, most decks run 8 to 10 draw supporters. If your opponent is running an archetype you can make more definite assumptions right out of the gate. You should know Terrakion is being played with Revive and Exp. Share. It is a lot of homework but it pays off to know at least the skeleton frames of the major decks. Are Zek-eels running Skyarrow Bridge or how many copies of Super Scoop are most ZPSTM decks running can all be crucial questions in a match. Having an answer or educated guess to questions like these and then being able to figure out your opponents odds for drawing it should help dictate the correct plays.